← Trade Begets More Trade …. Yes, But More is Needed. U.S. Presidential Campaign’s Top Issues — Jobs, Trade and Globalization — Getting Real. The political polarization of trade this campaign season is an historical first. It’s clear that globalization has gone out of fashion. There is a real backlash against free trade. To me there is a real need to show that globalization and free trade are not just for the elites. There is a critical need for proactive policies. Here are some of my observations concerning U.S. trade policy and globalization. Yes, workers have been hurt by globalization. The remedy is more training programs and significant upgrading of the Trade Adjustment Assistance legislation. Greater assistance by public universities and other educational institutions should be encouraged and even required. Both state and federal officials (as well as private sector CEOs) involved with job creation and economic development must become more outspoken in defense of the benefits of trade. This includes imports as well as foreign direct investment. We need multiple public champions and advocacy of the benefits of increasing engagement with the global economy. But so far American public policy as well as corporate policy have not distributed the benefits of global trade more equitably. What is certainly not good public policy proposals are imposing walls around U.S. imports (tariffs or quotas), abrogating existing trade agreements, or terminating existing trade negotiations (TPP and TTIP). Yes, greater enforcement of trade obligations might be useful. But the U.S. has already been very forceful in WTO litigation and reorganizing federal efforts as to this function. What needs to be guarded against are possible protectionist decisions of the International Trade Commission and the International Trade Administration. They along with the USTR administer a range of the trade remedy laws and market access legislation (dumping, subsidies, safeguards, and retaliation). So far to good but the underlying tendency is always present. Encouraging foreign direct investment into the United States is crucial. The existing CFIUS review of such investment for national security reasons has really proven to be a bar and disincentive to significant Chinese investment. This needs to be seriously looked at again. Energizing our participation in negotiation newer trade rules (for corruption, labor and environment, among others) and related rules (such as investment and competition rules) in the WTO is strongly suggested. And moving forward on negotiating or renegotiating bilateral investment treaties and tax treaties is essential to encourage more cross-border flows and to make much more equal the payment of taxes by multinationals. Reinvesting and repatriating some of this money back to the United States is obviously a welcomed outcome. In addition to these proposals I suggest addressing the issue of civil and criminal jurisdiction over the actions of U.S. multinationals abroad (through their affiliated subsidiaries and other entities. This would significantly help in administering out trade and economic regulation generally and specifically concerning a range of related areas such as human rights laws, sanctions legislation, counter-terrorism legislation and U.S. foreign policy generally. In conclusion. The upside of this historical political debate over trade is that is can sharpen our awareness of trade and globalization, as a good for the U.S. economy. And what now needs to be done, even if somewhat belatedly. ……”Jobs and Trade on the Campaign Trail.” New York Times (April 3, 2016). ……. “US Politics and Free Trade.” Financial Times (April 8, 2016). ….. “Globalization in Reverse.” Wall Street Journal (April 4th, 2016). 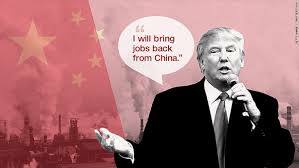 ….. “Anger Over Trade is Boiling for Voters.” New York Times (March 30, 2016). ….. “How Trade Made America Great — FedEx’s Fred Smith at Yale.” Wall Street Journal (March 26, 2016). ….. “Protectionism and Presidency.” Wall Street Journal (March 19, 2016). (Graph of Export / Imports & Trade Actions). (Graph).